After completing the Rat Catchers quest, you will have access to an Activity - The Rat Pits. Each of the rat pits is for different growths of cats - eg: lazy cats. The rules may vary but the general idea is that two players duel and gamble with their cats, and the cat that catches the most rats wins. The number of rats killed is set though. If your cat either dies or runs away from the fight your opponent will win. Warning: Your cat may die during this Activity. If it does, you will need to buy a new cat from Gertrude. There are 4 different rat pits across RuneScape. Each pit is for a different growth stage of your cat: kitten, grown cat, overgrown cat and wily. 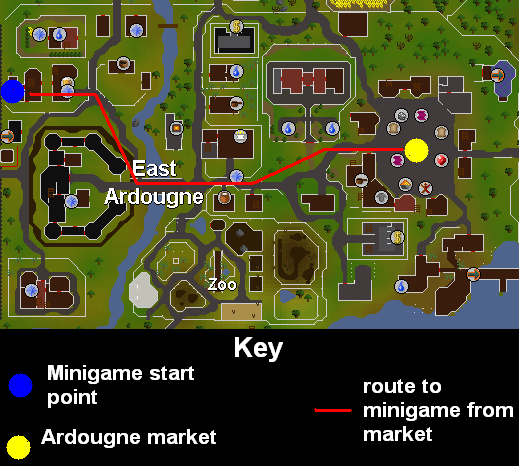 To get to the Activity you must go to the house in the northwestern area of East Ardougne. Talk to Jimmy Dazzler to start the Activity. 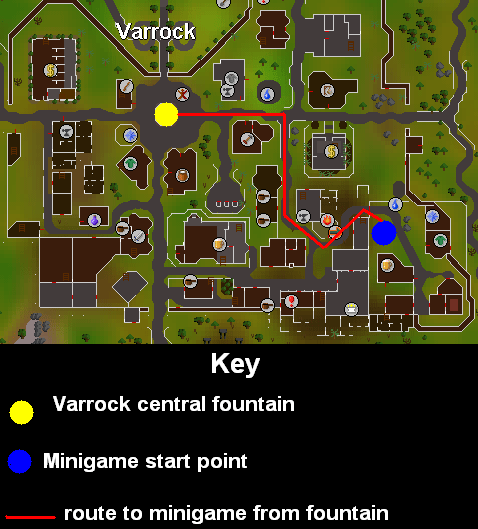 Grown cat rat pit in Varrock - To get to the Varrock Rat Pit, go near the start point of the Family Crest quest. Next to a manhole will be Hooknosed Jack. Talk to him to start. To start the overgrown cat rat pit Activity you must talk to Smokin' Joe, who can be found in the basement of the Laughing Miner pub. Wily cat rat pit in Port Sarim - To stat the Wily Cat rat pit Activity you must talk to Felkrash in Port Sarim. He can be found slight northeast of the Port Sarim fishing shop. Use the plus (+)and minus (-) to place a bet that your cat will win. The minimum amount per round is 100gp. Each player must bet the same as their opponent. A confirmation screen will be shown, so you can confirm your bet. If you accept (which you have to do in order to play the Activity) your cat will run into the pit and start attacking rats. A certain amount must be caught in order to win the Activity. Just take care of yourself - this is a very cautious approach, if you choose this your cat may run away from the fight! Stay in for as long as you can - This is a cautious approach, again, if you choose this your cat may run away from the fight. No guts, no glory - This is an offensive approach, if you choose this your cat may die during the game. Go berserk! - This is a very offensive approach, again, your cat may die when using this tactic. Choosing either of the cautious options is recommended for new players in the rat pits, whereas the offensive options should be used for more experienced rat pits players. Note: Each game has a time limit of 2 minutes. If you win you will obviously be rewarded. You can win by either catching the required amount of rats faster than your opponent, or if your opponents cat runs away/dies. You will get your money back as well as the money your opponent betted. Obviously there has to be a loser. If you lose, you will lose that money that you bet before the game started. The ways you can lose are if your cat runs away/dies or if your opponents cat gets the required amount of rats first. There will not be a winner every game, as sometimes you may draw. 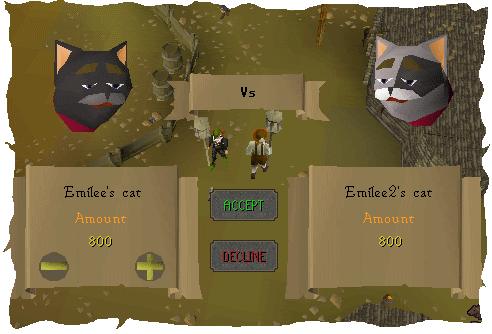 Each game has a time limit of 2 minutes, so if neither cat has caught the required amount of rats, and they are both still in the game when the time is up then the game will be declared a draw, and each player will get their money back.